A wonderful example of how to add blue and white Chinoiserie to your kitchen. The gas stove is gorgeous. This one is the very best! I want it!! 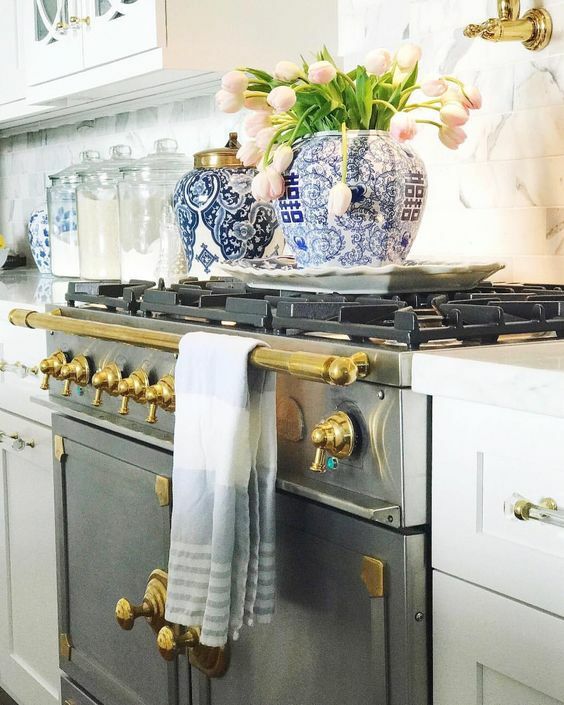 Love the addition of the clean blue and white Chinoiserie to this kitchen. Chinoiserie elevates any room, and the kitchen is usually overlooked. My tiny kitchen has been the recipient of my rose and green Chinoiserie collection because the living room mantel was too shallow. It's now a "beauty spot" in this more than an century old house. Where did that beautiful ginger jar with the brass top come from? Amazing! Beautiful ginger jar with the brass top...where is it from?